The Louisville Mini Maker Faire will be a family-friendly showcase of invention, creativity and resourcefulness, and a celebration of the Maker movement. Family-friendly means it’s for people of all ages. It’s never to early to introduce problem-solving, and mechanical and artistic expression. And it’s never too late to continue a craft or try new technologies. It’s a place to go where everyone can participate, bringing together families and individuals to celebrate the Do-It-Yourself (DIY) mentality. It brings out the kid in all of us! Showcase means it’s available for all to see and do. Out of garages and spare bedrooms, work spaces and offices, and into lively displays and open demonstrations, you’ll get to see and interact with projects ranging from gizmos to exploding watermelons, from fire-breathing ponies to yarn bombing. Invention – If necessity is the mother of invention, invention is the parent of the Maker Faire. If it doesn’t exist, someone will make it. Don’t take your world for granted – invent something cool! Creativity – The act of creating takes a word, a concept, an idea and makes it real, makes it happen, in a new and wonderful way. It’s the spark and the fire that results. Maker Faires are filled with creative ideas that have been made into creations. Resourcefulness is both recognizing the abundance of resources we have – interesting materials, recycled and re-purposed objects, sustainable energy, experienced Makers – and using them in new, different, and creative ways. It’s also the spirit of trying, iterating, and learning that helps these projects come to life. Celebration – Well, everyone loves a party. Making is a contact sport that everyone can enjoy! 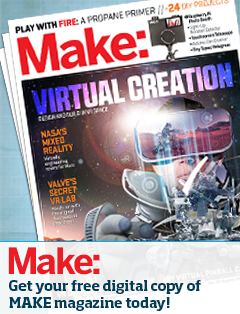 Maker movement – See all of the above. It means being an active participant in one’s own life and in the life of our communities, changing things for the better. A Maker Faire has booths, displays, demonstrations and workshops all designed to share what people are making, inventing, creating, and learning. Come one and come all! The Louisville Mini Maker Faire is going to be about 2% of the size of the mother Maker Faire in San Mateo. But we’ll have 100% of the creative and entrepreneurial spirit, because that always fills the space available.